The raw material for the soundproof booth is sourced locally – its main material is Finnish birch plywood. 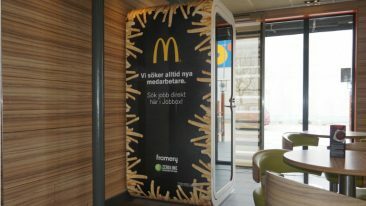 Framery’s soundproof phone booths, made from Finnish birch plywood, are being snapped up for open plan offices around the world. A new two-person model is being launched on the US markets. 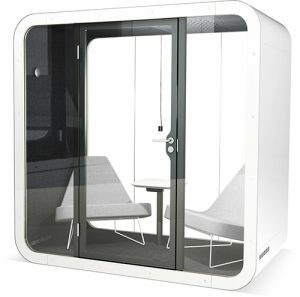 Framery, which manufactures soundproof booths particularly for the needs of open plan offices, is bringing its new two-person model to the US markets. Its official launch will take place in June at one of the largest furniture exhibitions in North America. At last year’s fair, Framery’s one-person booth won one of the most significant furniture design awards in its category. Framery’s new space, designed for two people, can be furnished and lit according to need, for example for video conferencing or one-on-one conversations. Framery is growing at a phenomenal speed: the company, established in 2010, has increased its turnover and personnel in an impressive pace during the past few years. In 2015, the company’s turnover was 5.1 million euros. This year, it is growing at a rate of 20 million euros. Framery’s clientele consists of companies from small offices to the world’s best-known brands across the globe. The company is quickly expanding abroad. Approximately 80 per cent of its products are exported, the largest export country being the US. Other export destinations include the UK, the rest of Europe, Canada, Singapore, India and China. In May, the Kauppalehti magazine named the company the strongest growth company in the Pirkanmaa region in Finland. The jury based its decision on the innovativeness and design of Framery’s phone booth.